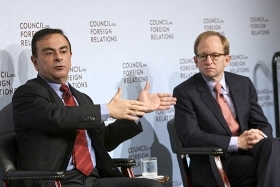 Ghosn, left, appeared in Washington earlier this year with former U.S. car czar and author Steve Rattner. (Bloomberg) -- Carlos Ghosn, Renault-Nissan CEO, said he had “no hesitation” in declining an offer last year from the U.S. government to lead General Motors Co.
“Renault and Nissan were in the middle of the worst crisis in the auto industry,” Ghosn, 56, said in a statement. Ghosn confirmed the offer that came in 2009 from Steven Rattner, who then was head of President Obama's task force managing the reorganization of GM and Chrysler Group. Tom Wilkinson, a GM spokesman, declined to comment, and also said the company wouldn't discuss a forthcoming book by Rattner to be published on his experience leading the U.S. Treasury Department's auto task force. Alliances such as the one formed in 1999 between Renault and Nissan are preferable to mergers, Ghosn said. He discussed such an option with GM in 2006 that former GM CEO Rick Wagoner rebuffed. “The potential was clear and compelling for the alliance and, I still believe, for GM,” Ghosn said in the statement. Potential synergies Nissan-Renault indentified from such an arrangement were “colossal,” Ghosn said today in an interview with CNN. Rattner “would not see this happening,” Ghosn said. “I don't think anything like this can work unless there is a mutual appetite,” Ghosn said. Ghosn also told CNN that reports he'd been approached to lead India's Tata Motors Ltd. were untrue.